I see a lot of questions asked about WHEN one should measure mash pH. I thought it would be useful to walk through the steps first and discuss the acid and buffering system of a mash in the real world, as well as some thoughts on a good meter. Choose a meter with resolution and accuracy out to +/- 0.01/0.02 pH units. This may limit your choices to meters over $100. A 0.1 resolution meter maybe enough for mash pH measurement and give more choices under $100. You get what you pay for however. Choose a meter that allows for a 2-point calibration. You will need to calibrate ‘slope’ between 4.01 and 7.01 pH solutions, appropriate pH ranges for brewing. Choose a meter with replaceable probes. Many bench and pen-style meters allow for probe replacements, and often the probe is the source of problems, and the most delicate part of the instrument. Replace your calibration and storage solutions often. They degrade over time and can become contaminated with use. Many people recommend the Hach Hanna Pocket Pro+ and either the Milwaukee MW101 or MW102. I have the MW102 and have been very happy with its performance. Hanna meters are bought directly from the Hach website, and have a good reputation for support. You can find Milwaukee meters on Amazon – and watch for a sale. Like any good measurement instrument, you get what you pay for. A $30 meter will most likely not give accurate results or last. I recommend immediately calibrating your meter per the manufacturer’s recommendations. This varies meter to meter – so read the instructions correctly. The Milwaukee meter allows for 2-point calibration, but across three possible values, 4.01, 7.01 and 10… so setting the slope should only use the 4.01 and 7.01 solutions, and you skip past the 10 calibration point. Most meters ship with pillow packets of buffers that can be used when mixed with distilled water. The pillows also store very well, and are a good alternative to buying premade solutions. It is also recommended to perform a stability test. This measures the probe’s ability to stay constant in a known pH solution (like the 4.01 buffer or the 7.01 buffer) over time. Ideally you should see little shift in variation and be able to chart the errors. The meters we use are not lab-grade, so there will be swings in the errors. A great article posted by AJ DeLange at Homebrewtalk.com details this process. All meters should be stored correctly and storage solution changed regularly. This ensures the probes do not dry out. Store the meter inside your house in a stable environment. Don’t subject it to large swings in temperature. There seems to be some confusion about when to take measurements, and what those measurements actually mean, and steps required to fix a problem, should one arise. My process is fairly straightforward. A 60 minute mash is easy to break into 15 minute or 10 minute segments, starting at the 15 minute mark. A metal or glass dish that can cool quickly. I use a nest of old metal ceramic coated mixing bowls to create an ice bath. This keeps the bowl chilled and a small one or two ounce sample of hot wort cools very quickly. A sampling vessel. I use shot glasses. A mesh filter – this is used to remove stray bits of grist. pH Calibration solutions and a cup of distilled or RO water for rinsing. Something to take notes on… I use the back of my Adjustment Summary sheet printout from Bru’n Water. I typically take measurements at 15 minutes, 30 minutes and toward the end of lautering (output of wort from the MLT to the BK). I note both the temperature of the wort (MW102 has ATC with a temperature probe) as well as the pH. If the measurement is not where I expect it to be, I will decide if I need to make an adjustment, but generally I will let things ride, and confirm the measurement 5 minutes later. At that point – I will know if I need to stop my mashing cycle and add either acid or alkali. I never add more than needed to move the pH 0.1 units in either direction. And only when I am well outside the 5.2 – 5.6 mash pH range. Stir extremely well and restart the mash at that point, and I extend my mash period by 15 minutes. Calibrate your meter if you haven’t already. Rinse the probe in DI water. Remove a small 1-2 ounce amount of hot wort and place it into the cold metal bowl, swirling to cool. When the wort is cool to the touch, it is ready. NEVER put your probe into hot wort – this can seriously damage the probe. Always make measurements with the wort at or near room temperature. Pour the cooled sample into a shot glass, filtering through the mesh if needed to remove as much of the grist as possible. Grains sticking to the probe can alter the reading. Place the pH probe and thermometer into the sample and wait for the readings to stabilize. This may take a few seconds. Most probes have an indicator for when the sample reading is good. Write down the readings and rinse the probe. Place the probe back into storage solution until the next reading is required. It is a good idea to decide where in your system you will take the measurement, for consistency. I like to sample from the return hose on my RIMS system. Do what is convenient, but apply it consistently through your procedures. I have written before about mash pH being a dynamic system. For most brewers, we are looking to get into a specific range of pH, and tolerate a +/- reading of about 0.02 with a good meter. In reality, the pH of the mash drifts as the buffering capacity of the malts and carbonates are exhausted. This may cause pH to shift up. In some mashes, the pH will drift down. You are looking for the 30 – 45 minute measurements to stabilize at or near your target mash pH. In reality, if you target a mash pH of 5.4, which is the safe middle ground for most beers, you will find readings above and below that mark. A perfect reading of 5.4 at 15 minutes may show that your mash is going to drift away from that mark later. Experience and patience is required. DO NOT PANIC if your readings are not on target! Reacting too soon and adding acid or alkali to control the pH may lead to adding too much and having a more dramatic and potentially harmful impact on the mash. I like to pre-calculate both an acid and an alkali addition in Bru’n Water so I know that I am adding only enough to theoretically impact the mash 0.1 units in either direction. This prevents me from adding more than necessary, and forces me through planning to be aware of where I should be. Combined with experience, I can make the right decisions. I have seen way too many instances where people respond and attempt to add a bit, measure, add a bit more – and the result is a disaster. Don’t waste your time chasing a pH target without a plan. We manage mash pH to make sure optimal enzymatic activity in the malts. Bringing your mash into the proper zone ensures the full conversion and extraction of sugars as well as give the fullest flavor from your malts. Mash temperatures, of course, also impact fermentability and can favor certain characteristics. I have a goal of getting to conversion as quickly and consistently as possible, which means that my water and mash chemistry must be accurate from the outset. As soon as I mash-in, the grist is hydrating and enzymes are activated and acting on the available starches. As the grain continues to hydrate, more starch is released, as are buffers. At the beginning of the mash, this chemistry is dynamic and chaotic, but will seek a balance. I want this process to stabilize as quickly as possible without intervention through the entire mash, without passing outside of the 5.2 – 5.6 pH window. Your recipe will have a dramatic impact on the change over time in the mash. A recipe heavy in roast and crystal malts will start low and drift up, where a pale ale recipe may start in high and drift down. Experience will show you what to expect. I have stopped using the iodine test for conversion as I can usually smell and taste and see the results. That said, the pH sample is a perfect opportunity to test with iodine. (Google for iodine conversion test) I have also occasionally used a refractometer to measure the increase in gravity to double-check. Many brewers are seeking to shorten their mash times and seeing full conversion in just 10-20 minutes. I find that on my system conversion is complete around the 45 minute mark, however, I continue to mash for the full 60 minutes and deploy a mash out. I find that this aids in lautering and helps with my efficiency, but your mileage may vary. When you sparge, the mash has exhausted most or all its buffering capacity, which makes the sparging liquor’s alkalinity an issue. A high pH over 6.0 can extract unwanted tannin from the malt, which typically show as astringent. If you are lautering with RO or DI water, then you can lauter out without concern. A bit of acid can also bring that liquor pH under 6 to make sure that the run off stays under 6.0. When using water with alkalinity – the pH will rise more rapidly as it is introduced to the mash – and you should treat that liquor appropriately with acid. If you do NOT sparge with RO or DI water – you should regularly check your run off pH to ensure it is below 6.0. Otherwise, stopping lautering when the gravity reaches between 1.012 or 1.010 will also help reduce tannin extraction into the kettle. If you are experiencing astringency in your beers – this is a likely place to start. Mash pH will follow into the kettle, where it is further reduced both by boiling and by dilution of the sparge water. Some brewers also manage this pH, and will add some or all of their minerals into the kettle. This will cause a fairly dramatic reaction as the buffering ability of the wort is diminished. Many books recommend bringing the boil pH to around 5.2 to ensure large fluffy break formation. Chris Colby of BeerandWineJournal.com covers this an article. I have gotten into the habit of adding a very small amount of acid and watching for the large fluffy break formation, rather than relying on mineral additions. The yeast will create the proper pH environment for their replication and fermentation phases. There is evidence that boil pH has an effect on the finished beer, and can certainly impact yeast stress. In most cases, you do NOT need to worry about it before fermentation. There are many exceptions – especially sour mash or sour wort derived beers, but even then some specific yeasts and souring bacteria thrive in the low pH environment. Most beers will finish in the low 4.0-4.4 ph range. You should be willing to explore adding lactic or phosphoric acids to beers to meet specific characteristics. I like my saisons to have a tart finish, and find that a tiny addition of lactic acid (always to taste) to help sharpen up ester expression and cut down on phenols. Other beers, such as stouts may benefit from adding baking soda to sweeten up and emphasize malt characteristics. Many people believe this cuts down some of the sharper roast characteristics that may be undesirable. Using a pH meter at this point can be very helpful in note taking and ensuring that batch to batch your beers are consistent. I’ve been trying to figure out my first mash pH reading tonight. Brun Water pegged me at 5.4, but a cooled reading at 10 minutes in showed 5.54. (Meter is a calibrated MW102).I made no adjustments. After the first runnings were in the kettle, I cooled and checked another sample, which read 5.42. Does this indicate that my mash pH WAS correct, according to Brun Water? Should the first runnings pH be the figure that most closely resembles the Brun Water prediction, per your ideal reading taken in the 30-45 min range, or does it have to be taken of mash and not wort? It looks like you may have some moderate alkalinity in your water? It seems that perhaps it took longer than normal for the phytin reactions to acidify your mash. 5.4 into the kettle is fine, and good to see BWS got the estimate. Remember that pH will drift somewhat, especially with liquor alkalinity that is moderate or high. As acid is formed and calcium reacts with phosphates, the levels of buffers will exhaust, allowing the pH to fall. This would cause a high reading at grain in. The inverse is true with low alkalinity. The first reading is low (with excess acid) then rises as the malt buffers go into solution. I would take a 30-45 minute sample to track the shift. You might want to target 5.2-5.3 so that the mash stays in the butter zone longer. Just spitballing there. Used RO water, but I did add pickling lime (porter with 9% roast) to get to a target of 5.4 (with a .01 resolution scale). I intend on tracking the shift in the future, for sure. However, regarding the mash pH figure Brun Water is generating – at what point in the process between dough-in and coming to boil is our actual pH measurement ideally supposed to match that predicted pH in Brun Water? I.e. in my case, the first runnings falling within .02 of predicted – is that what we’re gunning for since, as you stated, a large drift in pH can occur during the mash. Therefore, should the pH measurement at your ideal sampling time (30-45 min) be the same as the pH of the first runnings? Sounds good. It might be worthwhile doing some measurement in water+lactic to figure out how potent it is. It does lose effectiveness over time – taking up atmospheric moisture and converting slowly to chalk. By adding lime which results in an instant load of alkalinity – your results make sense. I think you need to work out the best times for measurement with your system. I run a very coarse mill – so I tend to check at 30 minutes and during the ramp to mash out. There can be as much as a 0.1 unit swing with most of my pale grists. If the change continues past that 30-45 minute mark, then you are also likely still converting. But yes, normally I would not expect a massive pH delta between a 30/45 minute reading and a 60 minute reading, unless you are step mashing. Heating between steps will increase the energy in the system and potentially also cause a shift. IME that shift is nominal. This is great – thanks again. I encountered very little discussion on the internet about tracking pH between dough-in and first-runnings and how/when it should correlate to Bru’n Water’s generated pH. Ultimately, tracking this data will help in developing an understanding. As long as I fall within 5.2 to 5.6, I’m not going to trip. The OCD in me will have to come to terms with the fact that pH can be dynamic and shift during the mash. Ha! I’m also begining to adjust my Ph post-fermentation. Especially for very hoppy beers (dry hops tend to raise Ph). What amount of lactic acid would you choose to begin with for acidification? I’ve made a try with 1,25ml but I haven’t seen any Ph change. Thanks in advance for you time, you blog is very inspiring! If you are not seeing a pH drop, you have some buffering going on. Do you have a water report? Using chalk? Most of my adjustments are made in a measured glass, then scaled by taste to the remaining batch. I haven’t worked out any general recommendations beyond that. Remember that the yeast really set your finished beer pH, but highly alkaline water can buffer the acid the yeast/bugs create. You can reach out to me via email through the form on my contact page. Matt, Just came across your article. Good article and very helpful. You said “At that point – I will know if I need to stop my mashing cycle and add either acid or alkali” What do you mean “stop my mashing cycle?” How can you stop the mashing cycle? The grains are already in water. Saccharification is in process. Also, is there some point into the mash where you cannot/should not make any adjustments? Hi David. 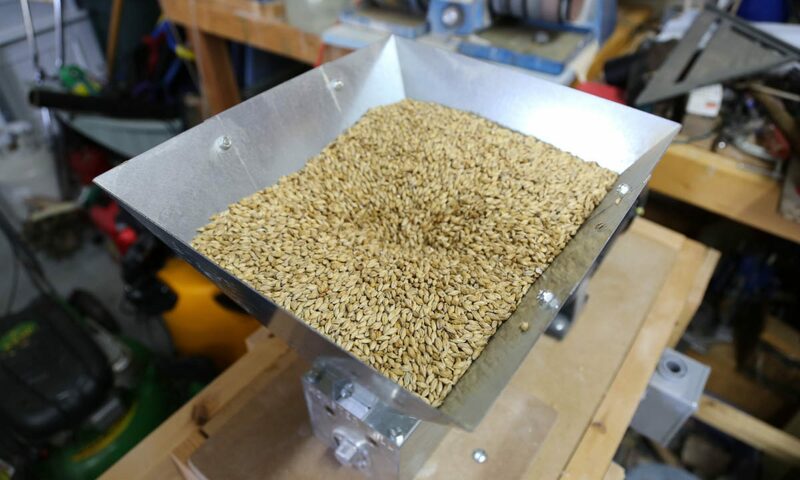 It would be more accurate for me to say stop my mash timers – of course grains in the water commit to conversion. So I would then typically extend my mash rest period, after any needed adjustment by 10-15 minutes to ensure the mash was at the required pH and converting properly. So say, stop at 20 minutes in, add my addition, and very thoroughly stir, rest to settle for 5 minutes and then restart my timers and circulation. That would add roughly 10 minutes to my mash period and should be noted in my journal. I don’t like to make much of an adjustment and normally would do so before the 30 minute mark on a 60 minute mash. I think the answer to the last question is when you might actually see “chasing the tail” effect of adding base (alkaline) and acids to try to quickly find the perfect spot. Depending on the size of your crush, water:grain ratios, and mashing technique (static, circulated, stirred) – you would need to find the sweet spot for your system. Pre-estimating the amount of acid or base needed to move your estimated mash pH 0.1 units should help to prevent the chasing issue. Thanks Matt. If I have this right, you don’t want to make any adjustments until the mash has somewhat stabilized which is usually at the 30 – 45 minute point. Do you do an iodine test at this point to see if saccharification is complete and if so how does that effect what you do? This is a great article. Many articles/posts in the forum are great at giving the “what” but not the “how” and many times not the “why.” Of course, much of that comes from not recognizing that not everyone is at the same experience and knowledge level. We’re all trying to learn. Anyway, really appreciate the article. Good information. Hi David, I used to do iodine tests, but don’t do that regularly these days. I find that the wort clearing is adequate and I normally see sweet aromatic wort around those time frames. An iodine test is a very good idea however. The timing of conversion may vary a bit between systems, size of crush, and, of course other variables. If you get toward the end of your mash and the pH is 5.6 or 5.5 say and you’re wanting to hit, say 5.4, will you make any adjustments? A 2nd question that I forgot to ask earlier. I have a single tier, 2 pump system with HLT, MLT & BK with direct heat. My mash tun has a false bottom with .69 gallons below. I only circulate water in the mash tun if I’m applying heat so I don’t burn the mash (or when I’m heating the strike water). The .69 gallons does make it to the BK. I calculate my mash water additions based the total water bill. How would you handle any necessary additions/adjustments in this situation? I would appreciate your experience here. Until now I’ve been brewing 11 gallon batches and I’m getting ready to brew 5.5 gallon batches as well. The .69 gallons, in terms of hitting pre-boil gravity for an 11 gal batch is in-significant. I’ll have to figure out the effect on my calculated gravity for the 5.5 gallon batches. This may not be useful info but I am providing in case it may help. I have been brewing a long time and, as you can probably tell, I am finally getting serious about my water/pH chemistry. Also, since you have a RIMS system, could you point to any good resources for learning how to understand and build a RIMS system. Thanks again for all the help. Typically not. At that point an adjustment might be made in the boil kettle, but otherwise I note the problem and try to figure out what went wrong afterwords. I add any dead space volumes to my mash volume in Bru’n Water but not to the final batch size. It hasn’t really seemed to make a lot of difference either way. One thing about the water chemistry bit – precision is nice, but in reality, the differences between a few mg of a salt is fairly minimal. I prefer precision for mash pH, but again, outside of very large swings, I am not sure I can taste the difference between a 5.4 and a 5.6 mash profile, save for some perhaps really roast forward beers. That said – consistency is important to me batch to batch. Read and reread the knowledge page at the Bru’n Water website – it is very helpful and then experiment. My RIMS is a commercial system – but I have been fascinated by http://www.theelectricbrewery.com and that is the direction I would take the next time. So much of the engineering is already done through tun configuration, false bottoms, valves to control circulation rates that it seems to come down to hardware selection and just not violating any core rules. For example, you could just add a 1200/1500 watt RIMS element outside your pump and only need to direct fire when coming up to temps… assuming proper pump rates and electronic controls. Cheers! and best of luck! Hi, I always read that ideal mash PH cooled down to room temp should be between 5.2 and 5.5. As the mash PH at mash temp (Let’s say 150 F) is actually slightly lower (from 0.2 to 0.35) if I target a mash PH of 5.25 at room temp, actual mash PH at mash temp should be around 4.85 to 5.05 ? I am confused with the measurements and targets. High Guillaume, thank you for the kind words. There is various information on the internet and I find recommendations of a range between 5.2 to 5.8 (and much of the literature narrows that). My best recommendation is to target 5.4 mash pH at room temperature for most beers. You are correct that the pH at mash temperatures is lower, however, most of the recommendations are calibrated to room temperature to save your meter’s probe from extreme temperatures that will shorten its lifespan. That said – I generally follow the pH target recommendations listed in Bru’n Water, which is for tart pale beers 5.2/5.3, for most beers 5.4, and for richer malty beers look for 5.5/5.6. Erring on the high or low side toward 5.4 should give you some room to ensure good conversion without landing outside of the range should a calculation be off a bit. It is an interesting experiment to brew the same recipe back to back with only varying the mash pH… One last note – some professional brewers report their mash pH at mash temperatures, it is important to adjust your expectations and get them to clarify. Many well known IPAs may be mashed higher – closer to 5.6 – as the resulting boil kettle pH will be higher and increase AA utilization. I haven’t tested this personally – but it is important to understand the pH system in brewing to help tweak a recipe from very good to great. If you have time, visit http://braukaiser.com/wiki/index.php?title=An_Overview_of_pH. I think it gives are very good and detailed overview. 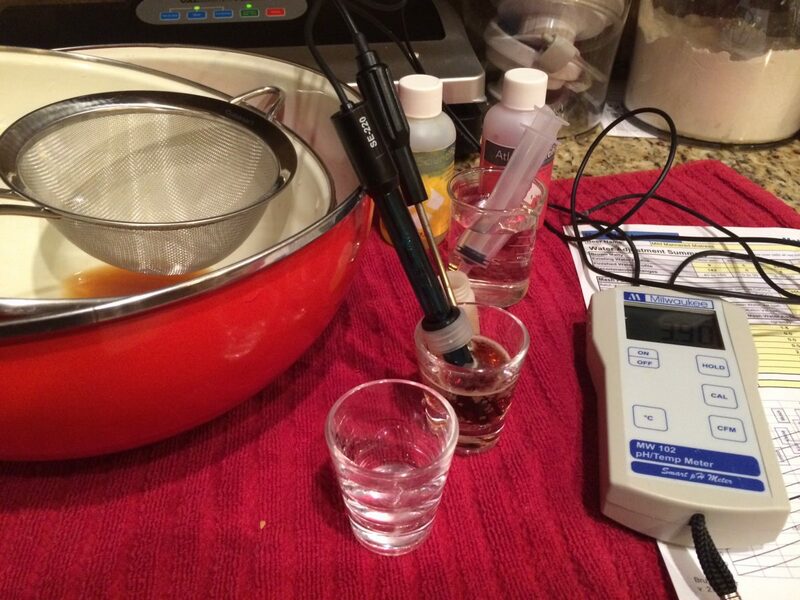 Do you find the predictions that Bru-N Water makes about your water match the real world measurements you take during brewing? Also, do you find the differences noticeable from mashing in at 5.3 vs 5.6? I’ve been working on a stout recipe for several batches now and the last two were drier and with less body. I went for 5.3 in the stout not knowing that they should be higher at say 5.5 or so. I use Poland Spring and use the info Beersmith provides on the mineral content of that water. The first couple of batches of the stout I used the Dublin water profile that can be found in several places all over the internet. I didn’t adjust for Ph as much (while I put some acidulated malt in I don’t think I was low enough) and found the beer to be astringent while the body and dryness seemed good. Trying to get rid of the astringency I kept my water profile simple the last two times; about 20ppm chloride and 20ppm sulfate and adjusted to 5.3 with lactic acid. And they were drier and with less body. Does this seem right? To me this isn’t a problem just a correction I’ll need to make next time and was wondering if you think the dryness and body are that affected by the ph? Or should I be looking elsewhere. Mash temp was 152 for 60 minutes with a recirculating eBIAB system. I like my dark beers better at a 5.5-5.6 range. It seems to enhance the malt expression. Remember that in the boil the pH will lower by 0.1 – 0.2 points which also affects break formation. This also increases hop utilization slightly. I would probably mash a dry stout lower – and increase the sulfate content slightly – look at the Black Bitter (V2) or Black Dry (V3) profiles. 200 ppm chloride seems fairly high – I usually will limit it to under 100 ppm. I get a very mineral character from it when overused. A little sodium or magnesium might help enhance the malt. I would reduce the lactic acid until your estimated mash pH is just under 5.5 to be safe. A high pH will cause astringency from husk tannins – but high mineral levels can also be perceived that way – difficult to diagnose. You may diagnose the issue (sort of) by adding a light solution of baking soda to your stout. Many friends report it opens up the malt and gives a richer mouthfeel – then mash at the higher pH. For a dry stout – dose with a drop of lactic acid and taste and consider a lower mash pH target. At least it might give you a hint in which direction. Of course, increasing wheat, flaked barley or oats may help with the body as well as a higher infusion temp – say 156-158F. Minerals can enhance the perception of body, but will not solve a grain bill issue.